Ilex x 'Nellie R. Stevens' - Nellie Stevens Holly Specimen. A true specimen holly. The Nellie R. Stevens can be pruned into a formal specimen or left to grow on its own as it maintains its natural upright pyramidal habit. It will also pollinate with a Chinese Holly blooming at the same time in the spring from anywhere in the same area. Nice dark green lustrous leaves are accented by red fruit in winter. Not only are the berries attractive against the dark green leaves they provide food and shelter for birds. Ours are grown as a single stem specimen. We offer the Nellie R. Stevens 5'- 6' in a 15 gallon container. Barriers, borders, screen or windbreak. Nice addition for formal gardens. 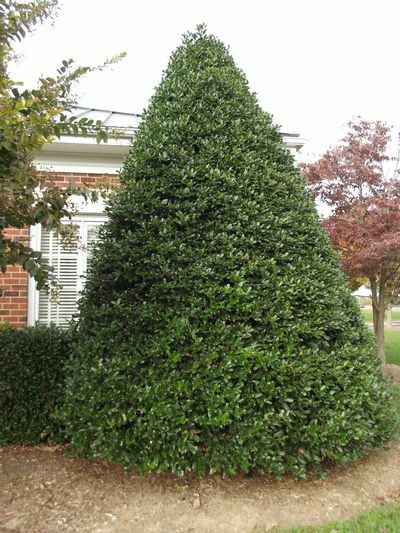 The Nellie R. Stevens is a hybrid cross of Ilex cornuta and Ilex aquifolium introduced in 1954. Used extensively in the southern states for many years. There are about 400 species in the Aquifoliaceae group of plant and nearly all of them belong to the holly species. Most are evergreen trees or shrubs with several species being deciduous (lose their leaves seasonally). Most varieties have flat shiney leaves with only a few having spines such as the American holly and English holly and their hybrids.